The UMKC 2013 Enactus Team with faculty advisor Cary Clark in front of one of Kansas City’s many iconic locations. 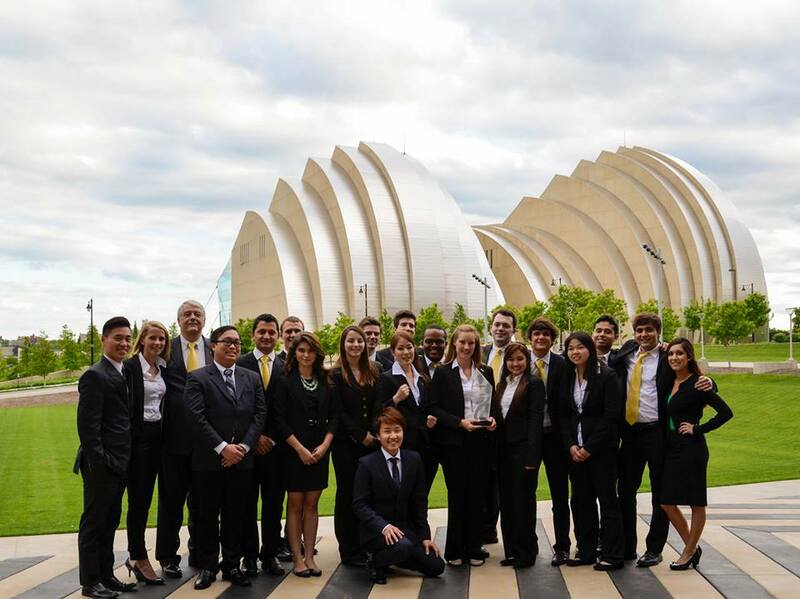 The UMKC Enactus team has earned more bragging rights. In addition to winning the regional competition in April, they have now been named as first runners up for their league at the 2013 Enactus National Exposition. The First Annual Aaron L. Levitt Social Entrepreneurship Challenge was held May 21 at the Ewing Marion Kauffman Foundation Conference Center. This civic entrepreneurship focused event was designed to allow Bloch School students to present innovative ideas that will better serve the Kansas City community and beyond. Jim Levitt watches as the teams prepare. Jim helped repurpose funds for the creation of this event in memory of his father, Aaron Levitt. 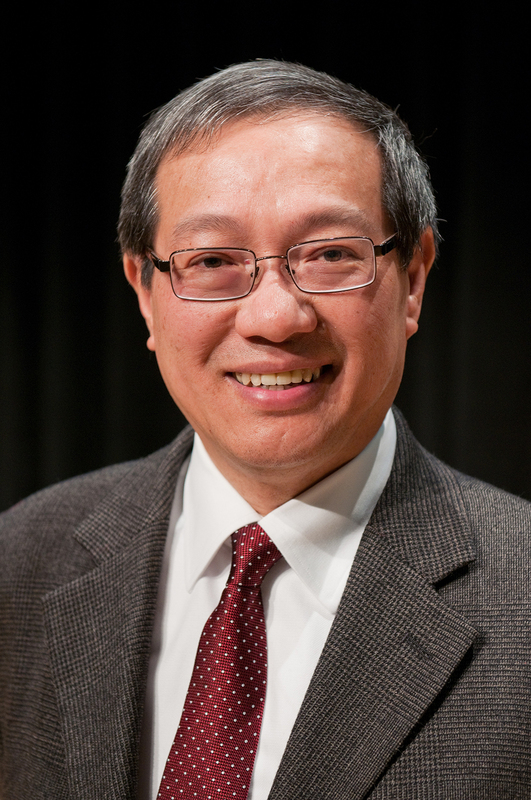 The University and the Bloch School formally announced this may that Bloch School Dean Teng-Kee Tan is taking a hiatus from his duties as dean of the Henry W. Bloch School of Management.Tan announced to faculty and staff on April 30 that he is undergoing evaluation due to the discovery of a significant health issue. Bloch School Associate Dean David Donnelly, Ph.D., CPA, will serve as acting dean of the Bloch School as Tan undergoes medical treatment. Tan has been with the Bloch School since 2009, and has been the catalyst for the success of the school’s new strategic plan and rebranding as the Henry W. Bloch School of Management. 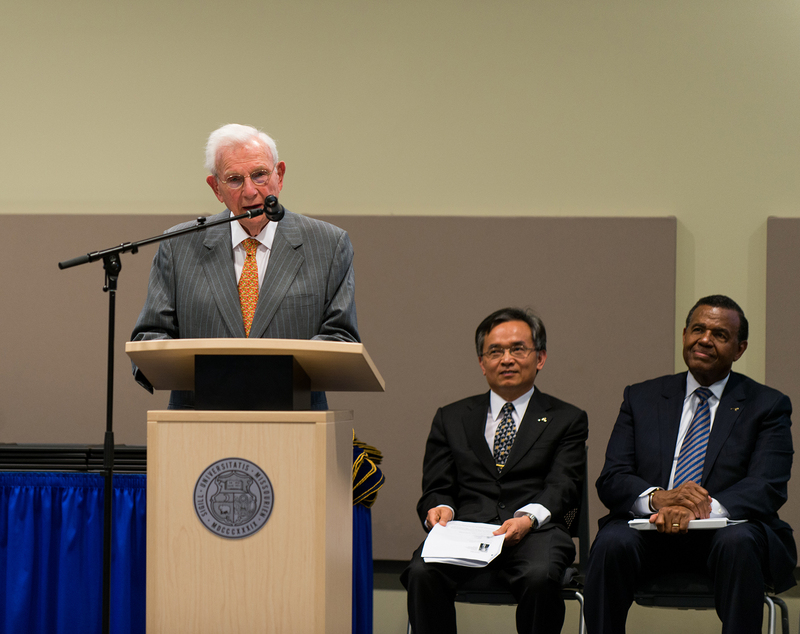 During Tan’s tenure, Bloch School benefactor Henry Bloch announced a $32 million gift to fund the construction of the Henry W. Bloch Executive Hall for Entrepreneurship and Innovation, a state-of-the-art building designed to propagate team and experiential learning. The building is slated to open for classes this fall. Tan says his current plans are to leave his post as dean no later than August 2014 and return to the school’s faculty while assisting University leadership in identifying a successor. The university will form a search committee during the summer to initiate the process of selecting a new permanent dean for the school. 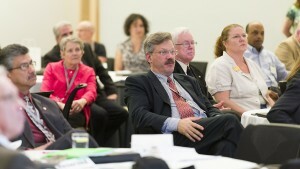 The University of Missouri-Kansas City’s Regnier Institute for Entrepreneurship and Innovation at the Henry W. Bloch School of Management has been selected by the Global Consortium of Entrepreneurship Centers (GCEC) to host the 2013 GCEC International Conference. The Lewis White Real Estate Center reached another milestone at the end of this semester with the first student to complete all the academic requirements for the M.E.R.E. (Masters of Entrepreneurial Real Estate) graduate. The 36-credit-hour, intensive two-year degree program pertains exclusively to real estate, with a focus on real estate trends such as the global shift in attitude towards eco-friendly developments, reducing carbon footprints and the expansion of green technology in new construction. From left, Michael Song, Henry and Tom Bloch talk with an EScholar graduate. For the third-ever graduating class of Entrepreneurship Scholars (EScholars), it was a night to remember. Even for entrepreneurs bursting with potential, who had spent a year in the company of top business experts, it isn’t every day you get to hear from a legend. The e-scholars had completed a rigorous 12-month certification program and had their ideas and plans evaluated by some of the best in the business. Many of them were poised to start up a business of their own design with some seed money and encouragement. And the energy took an upturn when Henry Bloch himself walked to the podium. 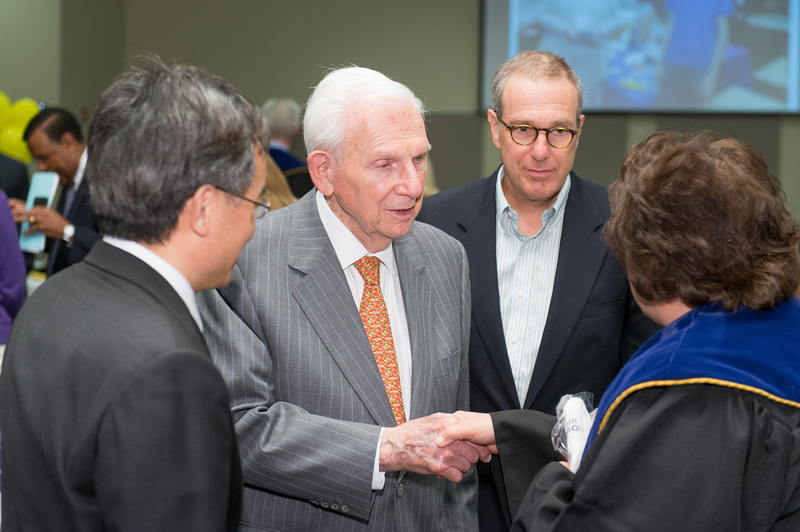 Henry Bloch addresses the 2013 class of EScholars at their April commencement exercise. The audience had started their journey a year earlier as eager applicants, intrigued by the offer of support and resources and the chance to launch successful business ventures. The Entrepreneurship Scholars Program, offered by the Henry W. Bloch School of Management at the University of Missouri-Kansas City, is a community-wide program designed to prepare brilliant and promising entrepreneurs with the skills and knowledge needed to launch world-class ventures upon graduation. 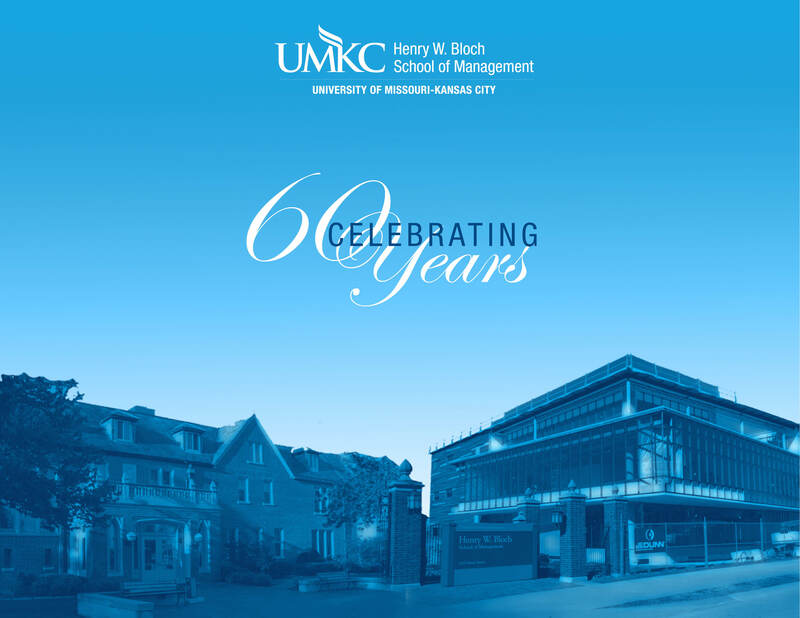 The applicants had come from the Bloch School, from throughout the UMKC campus, and from the community. During their year in the program, Henry Bloch had become a familiar and welcome fixture in classes and at campus events, always ready with a thoughtful question or a timely suggestion. 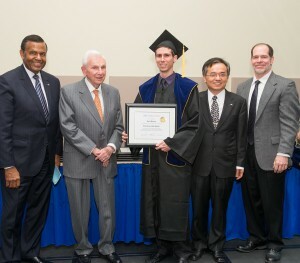 UMKC Chancellor Leo Morton, Henry Bloch, EScholar graduate, Michael Song and Mark Parry. This night, instead, he gave his audience a blockbuster of a talk. He began by deflecting all the thanks and praise to Dr. Teng-Kee Tan, Dean of the Bloch School; the faculty and staff, and the students for being the hardest-working bunch he had ever seen. He complimented Kansas City’s business community for helping refine the Bloch School’s vision and direction. He wove the theme of conquering a mountain through his remarks. 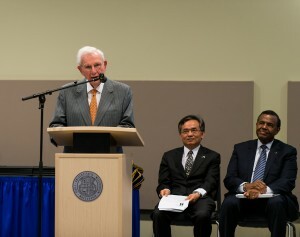 Describing these times as “the dawn of entrepreneurship,” he compared the students’ journey ahead to scaling a magic mountain – a trek for which they are well-prepared. He mentioned specifically their willingness to learn new things, their readiness to toss out obsolete ideas, and their ability to turn on a dime. “Modern miracles” he cited – space travel, personal computers, instant communication – were not part of his formative years; but they came from the minds of forward thinkers. • The quality of your early work determines your future – so start with quality. • Don’t try to get by with the minimum – give more than people expect of you. • Listen – if your customer did not thank you, don’t think him rude. It’s possible you failed to do a satisfactory job. • You will make mistakes; just make sure you don’t repeat them. Bloch reminded the audience that it is the habit of thinking things through – not necessarily the information at hand – that will serve them well. Data is fine, he said, but we need to be thinkers; remembering is no substitute for analyzing. View the speech in its entirety. Details of the EScholars program can be found online. Scholarships are available to all accepted applicants and will cover the majority of program costs. The only out-of-pockets costs for participants will be fees to enroll in one-credit hour course per semester (three semesters total).